Will New IVF Procedure Re-Energize Older Women’s Eggs? Women seeking help from a fertility clinic often do so because of their age; it is well understood that conception and pregnancy are less likely in older women. A woman’s eggs lose their vitality as she ages, making conception less likely. A new in-vitro fertilization (IVF) procedure is said to re-energize the egg so conception occurs more readily but the procedure is still experimental and controversial. 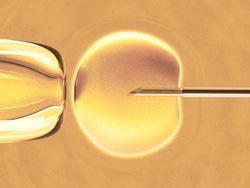 The procedure focuses on the mitochondria within the egg cell. Mitochondria are tiny organelles within every cell of the body. They are often described as the cell’s powerhouse because one of their main functions is to convert food and oxygen into fuel for the cell. The new procedure, called Augment, takes some of these energy-converting mitochondria from immature cells in the ovary and injects them into more mature egg cells being harvested for IVF. Only mature egg cells can be fertilized. When the Augment IVF is used, the sperm and mitochondria from the immature eggs are injected into the mature egg at the same time. Robert Casper, a reproductive endocrinologist in Canada, likens the procedure to a flashlight and its batteries: after a flashlight (the egg) has been unused on a shelf for 38 years, the flashlight probably still works just fine but its batteries (mitochondria) have probably lost power. When the old batteries are replaced with new ones, the flashlight shines brightly. Casper is director of the Toronto Center for Advanced Reproductive Technology, where the procedure is being used but no babies have yet been born as a result. The procedure is not allowed at this time in the United States because there is no proof that the procedure works safely; the US Food and Drug Administration has blocked its use. The Augment technique was developed by OvaScience Inc., based in Cambridge, Massachusetts. It is being used in Turkey and the United Arab Emirates and in Canada at Casper’s clinic. Not every doctor in Canada embraces the procedure with the same enthusiasm as Casper. Some wonder about long-term effects to the offspring that could be born of the technique: how will the amped-up cellular energy supply affect the lifelong health of the child? Others question the ethics of the procedure and question the wisdom of using humans “like guinea pigs” to test an experimental medical procedure. Although no babies have been born as a result of the Augment technique, Casper has used it on 20 women thus far and has 40 more on a waiting list. Eight women are pregnant and the first babies — twins — are expected in August. Their mother, 30, spent years trying conventional IVF and was devastated when nothing worked. She and her husband tried Augment as a last resort and she is thrilled with the outcome. Stein, Robert. "Fertility Clinic Courts Controversy With Treatment That Recharges Eggs." NPR / Shots. NPR, 5 Mar. 2015. Web. 13 Mar. 2015. "Mitochondrion – much more than an energy converter." BSCB. British Society for Cell Biology, n.d. Web. 13 Mar. 2015.